“An apple a day keeps the doctor away” is a saying you will hear from the moment you set foot into this beautiful world. But what does the phrase mean? Literary speaking scientists have proven that apples promote your health. It’s a good source of vitamin C that will aid your immune system and phenols to reduce cholesterol. It further has quercetin that protects your brain cells from the neurodegenerative disorder that causes Alzheimer. With that said, you understand why you should make apple a part of your diet. Until recently, whenever I visited different restaurants, I would find nice shape cuts of apples. It never occurred to me that I would buy my own tools to make the cuts and have even my poor eater daughter eating it. I often say, most times the presentation of the food matters. It will either make you want to eat it or not especially for those days when you lose your appetite. So, without further ado let’s find out the best apple slicer. Let’s watch the video fist. What Does the Apple Corer Look Like? 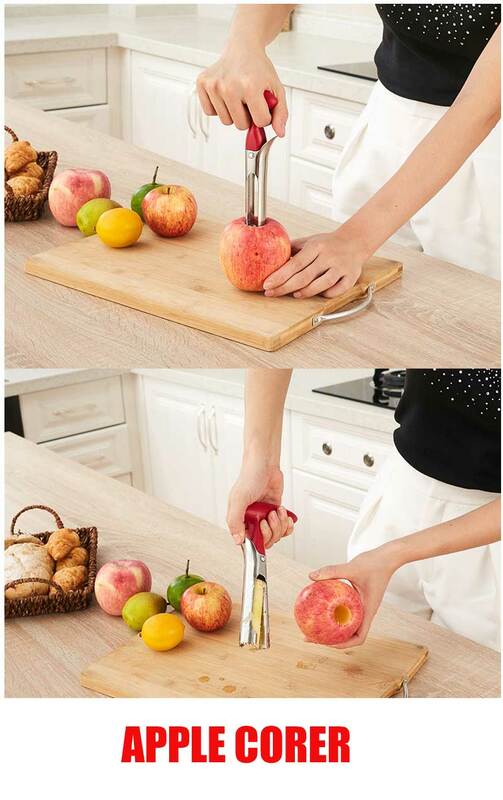 The apple corer simply looks like the image above and you use it to remove the core and pips from the apple. It removes the core following the diameter of the corer. Remember, you can have the corer in different sizes. It’s easy to use the corer because you only push the corer into the center of the apple and twist it then remove it. However, when you don’t have the corer you may follow the procedures below to core your apple with a knife. You need a sharp knife, cutting board and an apple. Wash and dry your fruit then set it on the cutting board with the stem facing up. Make sure you are using a thin blade knife. Insert it at a centimetre away from the center of the apple. That way you won’t cut the core. Go ahead and push it to the bottom of the apple and pull the knife out. Repeat the procedure 3 more times around its center. This makes four cuts that will make it form a square at the center. Now, set the knife aside and push the core with your thumbs until it comes out fully. The item is sturdy in construction and will give you 16 thin slices of the apple. Using the lid, slicing the apple to the bottom is as simple as pushing the gadget. The cover helps to push both the slices and the core off the blades. This is something that not most apple slices have. It is a multipurpose tool that uses the blades to slice and the corer to core the apple with ease. The lid will also help to protect your hands in case you touch the bottom side as the prepwork is cutting the apple. Whenever you have a thick and tough skin apple, just cut off the top part before you place the item on the apple to slice it. It adds an aesthetic value to your kitchen but it is also easy to clean since its dishwasher safe. 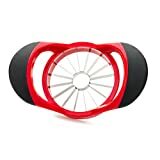 For all your apt cutting mechanism and classy design, buy the OXO apple slicer that has been a best seller for a while now. This is for a reason; the slicer has stainless steel sharp blades that cut through the apple with ease. The handles offer the user a firm grip that is non-slid when using the item. Still, on the handle, it has soft cushioned handles to offer you comfort while pushing it into the apple. The handles not only remove the pressure from your hands but are also raised thus keeping your hands off the table when it reaches the bottom. It will cut almost all sizes of the apples. When it comes to cleaning, although it’s said to be dishwasher safe some clients suggest that you hand wash it with dishwashing soap and water. Make sure you dry it properly though to keep it free from corrosion. The difference between this cutter and other apple cutters is in the quality of stainless steel used in the blades. It features the 18/10 grade of stainless steel. This is corrosion-resistant and never affected by chemicals and heat. The handles offer you a firm and sturdy grip thus ensuring there’s an even distribution of pressure. This then makes it easy to cut even the tough-skinned apple or pear. Rosle cutter is further versatile and you can use it to cut your potatoes as well. The shape of the blade makes it easy to cut the fruit all the way to the bottom. If storage is an issue for you, one of the handles has a hole that you use to hang the tool on the wall. This slicer is made using the sharp stainless steel blades to ease the slicing process of the fruit. The blades are further durable and strong which means you won’t use a lot of effort to cut through the apple. Made of silicone, the handles are wide and they offer your hands a comfortable, non-slip grip. Moreover, the item is safe to use because even with the sharp blades, your hands are a distance away. It also has the eye-catching color to enhance the décor of your kitchen. It will cut your fruits into 16 thin slices and allow you to easily remove the core. You may use the slicer when cutting your round and medium-sized apple, pear, orange or peach. You can either hand wash it with warm water and soap or place it in a dishwasher. The secret to the ease of cutting of the apples is in having the sharp blades and a perfect handle. Its blades are made using the top-quality stainless steel blades. 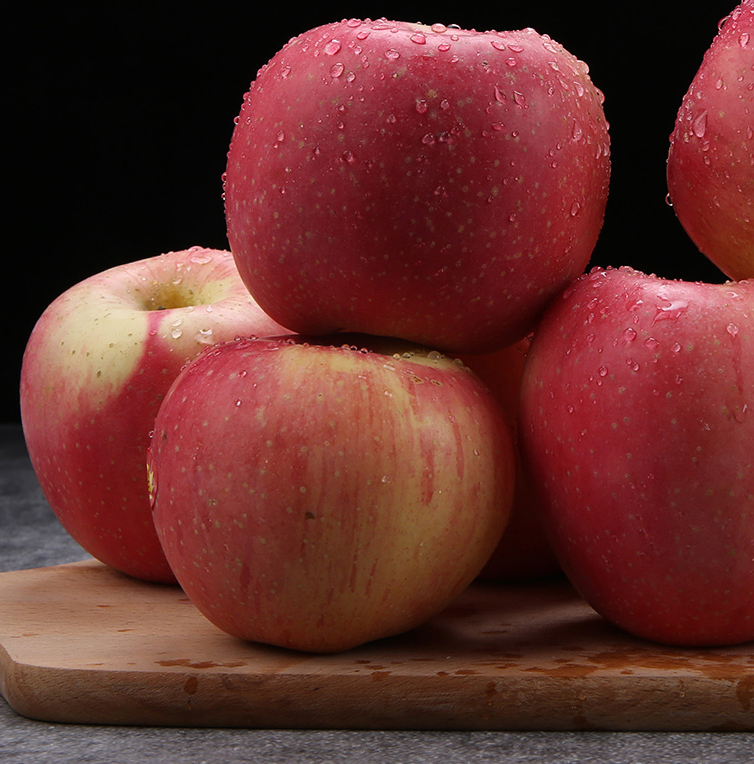 The blades are further durable and will produce up to 8 cuts of the apple. The item features a stylish design with a red color that when placed on the counter may enhance the focal point. Its handles are wide and they offer a firm grip. It’s made using the silicone which also gives you comfort as you cut the fruit. You can put your slicer in the dishwasher when you finish cutting the fruit or hand wash it. Be careful though to avoid cuts from the blades. Westmark is one of the famous brands when it comes to kitchenware. They have over the years produced high-quality kitchen items. 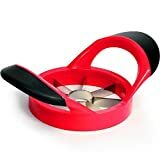 This apple slicer has its blades made using high-quality stainless steel and the handles are made using the high-quality cast iron. As a whole apple slicer, you have the sturdy construction that is durable. Moreover, with a single cut to the bottom of the fruit, you receive 10 pieces of ready to eat apples with a separate core. This item is easy, comfy and fast to use. To clean it, it’s best to use dishwashing soap and warm water. Whenever you are looking for an apple slicer that is made using the all stainless steel, here is the piece. It takes on the heavy duty and features a high-quality stainless steel make. The item is designed to deliver 12 slices of apples with a single cut. The wanleo apple slicer will cut through the medium and round apples, pears or onions. So, for every time you need to make your favorite apple pies consider buying or using their ergonomic design slicer. There are times when you have too much to do that you just don’t have time to do some things. This may alter the perfection of your food presentation. In such cases, the Enshey 3 in 1 machine comes in handy. Multitasking is the order of the day in our fast-paced world. So, an item that can partake in two tasks is definitely a savior. 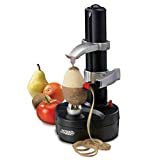 From slicing to peeling and then coring the different kinds of fruits you have this machine does an unparalleled job. Its blades are made using the grade304 stainless steel which is safe to use with your food. For those of you who love working with your children, this is the item to use. You are safe from accidents resulting from cuts. Its cast iron body is made using the zinc alloy which offers durability and elegant design. You further have the customer satisfaction guarantee if the item is not what you like. I always champion for multipurpose kitchen items when they are large items no wonder I’m rooting for this best seller. Made of heavy duty die-cast magnesium alloy, the item is durable and long lasting. Its coring, slicing and peeling blades are made using the stainless steel for durability and effectivity. When you want to use the peeler, it’s important to fasten the suction cup so as to offer enhanced stability. You are allowed to adjust the peeler so as to choose the thickness of peels you would like to remove. The item will work with your firm fruits like apple and pear but it also works best with potatoes. Although we have the 3-in-1 electric machines for peeling, slicing and coring the apples they aren’t quite common. The starfrit features a compact vertical design for easy storage. Its body features a durable ABS plastic material which is durable. Its base is further non-slip making it easy to use on your kitchen counter. You don’t need to hold the item while it’s peeling your fruit or vegetable because the spikes of the food holder put it in place. Furthermore, it only removes the outer skin. What I like most about it is that it does it so fast. What’s more, the item is auto set in such a way that once you have your peeled fruit it switches off. It will come with the spare blades and will only use 6V. If you would love to carry this gadget along for your camping places that have no light, worry not because you can run the item using the AC supply and battery. 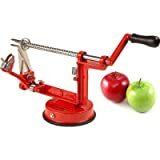 Made of high-quality chrome cast iron, cucinna pro apple peeler is durable, sturdy and long lasting. It has a suction cup that holds steady the item on the counter or table to keep it steady as you continue to peel, slice or core it. Like most other slicers, it has the blades made of stainless steel. They slice effortlessly since they are sharp. 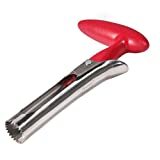 The peeler is versatile thus it works with both the potatoes and apples. All the work which includes the peeling, slicing and coring is done in a single motion. It has a pretty design which could change the outlook of your kitchen. Whether you want to use it for industrial use or home use is upon you. It features a heavy, sturdy, enamel-coated cast iron body. With its stainless steel slicing/coring blade it will swiftly remove the core as it makes the quarter inch slices. It has a suction base that holds tight on the counter when you are working on your apples. Its blade is adjustable to allow you to remove the thickness of the fruit you would want to be removed. You can even have the apple simply cored or sliced if you don’t want it peeled. This corer is made of high-quality stainless steel which makes it easy to clean and use. It’s further durable and corrosion-resistant. The item is meant for professional use thus it won’t break or bend but will give you a high-quality end result. Unlike most other core removers, the core removal is quite easy as it comes out with a single push. It has a sharp blade which makes it easy to core and its handle is ergonomically designed to give you a firm twist. You can also use the apple core on the bell peppers and pears. 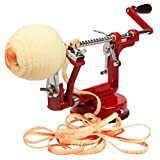 The heavy-duty and professional grade apple peeler is a simple yet safe to use item. 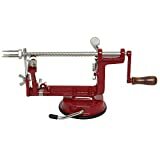 Kitchen basics apple peeler is made in the US using the strong metal that has high precision stainless steel blade. The item is simple and safe to use with a plastic handle, it gives you a firm and non-slip grip. It’s further dishwasher safe. Why Do You Need an Apple Slicer? I know most people are still reluctant about buying some tools for fear that they occupy more space in their already full kitchen. However, a tool like an apple slicer is small and portable which means that its storage should be a non-issue. It’s meant to cut or core your apples but you may as well use it when slicing other fruits like pear, quince among others. I like eating the apple peels but if you don’t feel like eating the peels, the slicer can help in removing the peels. Sometimes, when you have large establishments or a pool of people visiting your home, the apple slicer may just come in handy. You will need to cut them into perfect and desirable slices quickly and this slicer can do the work for you. 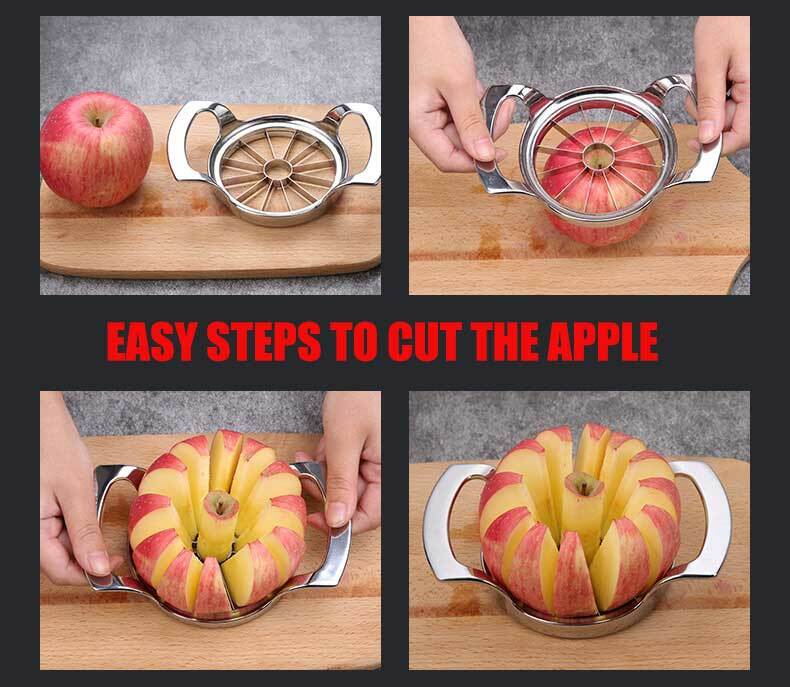 Using the apple slicer is easy you don’t even have to go for training. You just need a few basics and you are good to go. Like any other kitchen gadget, choosing the best apple slicer can be tasking especially since the market is flooded with different sizes and shapes. Nevertheless, follow the guidelines below when you are ready to buy yourself a slicer. Do you want the countertop ones or the handheld ones? Most of the apple slicers are handheld because they are flexible to use and are appropriate for home use. However, we also have the countertop ones that are set and they work on the counter. They are bigger and are mostly meant for heavy duty purposes. 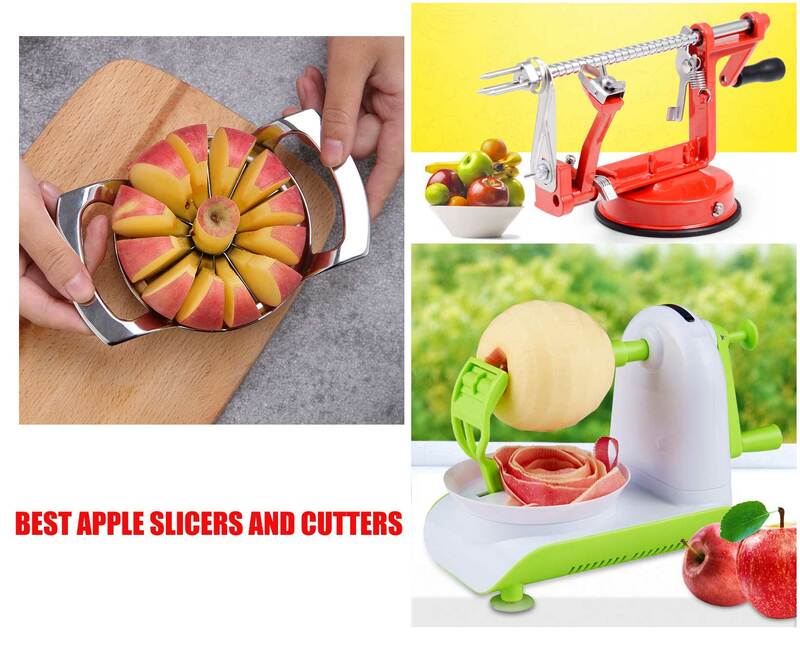 When you are looking to take such apple slicers, you want to confirm that it provides a firm grip using its rubber suction base. This will help to reduce the accidents that may result from the falling of the apple slicer. Remember, the hand-held ones occupy minimal to no space at all. In the past, apple slicers were manual but with the rise of technology, today we have electric ones as well. What makes the electric peelers appealing is the fact that they work in no time making it ideal when you have a lot to do. They also free your hands to take onto other tasks. This is because you just must set the apples and let it do its work. The fact that such slicers solidly depend on the power for it to work is a disadvantage since you won’t always have power. The manual ones feature some countertop apple peelers that you use the handle to peel or slice the apple. You don’t have to hold the apple as it’s being peeled. 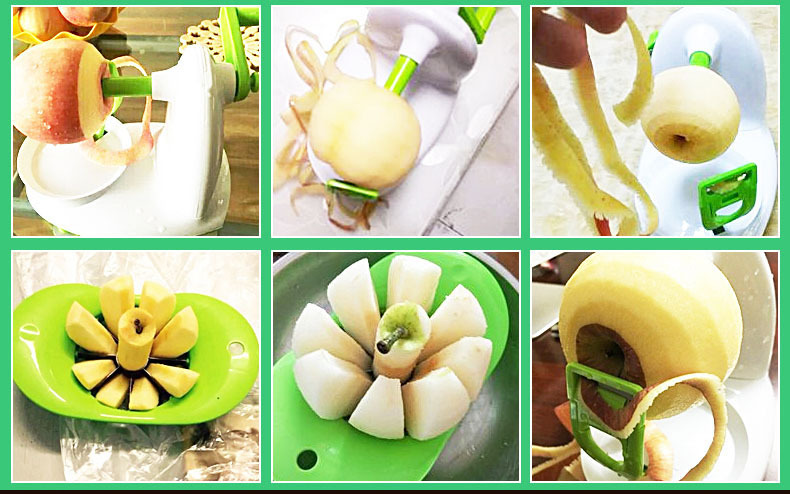 Another type of manual apple slicer is the one which you hold on your hands and gives you the liberty to peel or slice the apple however way you want. Some apple slicers will allow you to peel, core and slice the apples. 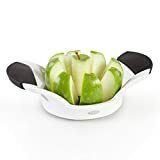 If you want the one apple slicer that can take on all three of the roles, then you should take on the countertop apple slicers that can core, slice and peel. You may even have the apple slicers making the spiral sliced apples for your kids to snack on. For easy slicing of your apple, you need to have the apple slicer blade being sharp. This happens when you have the stainless steel made blade. Luckily, in recent years, most manufacturers decide to use the stainless steel on the blade. This makes them durable and sharp for long-term use. With every tool you buy in your house, the elegance and fitting in to the design should be in mind. Apart from you buying the slicer for use in the kitchen, it should add to the aesthetic appeal. What’s more, you should have one that is easy to clean in the dishwasher. I happen to have seen so many options of apple peelers on Amazon while I was conducting my research. Therefore, you may want to visit that site so that you can choose your best apple slicer. Other sites to visit include Walmart, eBay and other kitchen stores. You can also visit the large kitchen appliance stores near you to get the best apple slicer. I must say, I love apples and I often have friends around thus I usually prefer the easy to use item that is also first with the ability to make me many slices. 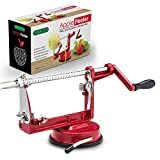 The product I’m talking about is Apple Peeler and Corer by Cucina Pro – Long Lasting Chrome Cast Iron with Countertop Suction Cup. Not only does it serve you right it’s also durable to use.